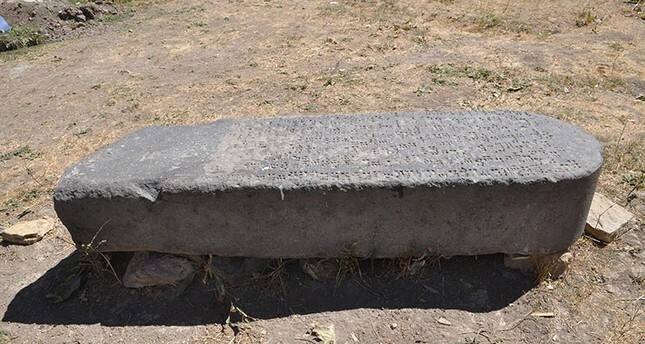 A 2,800-year-old stele from the ancient Urartu civilization which had been missing for the past 120 years has been found in Turkey's eastern Van province, reports said Tuesday. Discovered by German archaeologists during excavations in 1891, the stele belonged to Urartian King Minua (810-780 B.C. ), Anadolu Agency reported. Professor Bilcan Gökçe from Van Yüzüncü Yıl University's Archaeology Department had launched excavations to find Urartian itineraries in Van's center, Muradiye and Tuşba districts. The stele was discovered Topuzarpa neighborhood in Muradiye district and measures 2 meters and 20 centimeters in length and is made out of basalt. It features 36 rows of cuneiform script, which epigraphist Kenan Işık said was dedicated to the king's vineyard. Işık noted that the stele also explains libation rituals made by Urartian God Haldi and Goddess Arubani from the wine obtained from the vineyard. The team of archaeologists also found some Urartian tablets in the area. The stele has been transferred to Van Museum Directorate and will soon be put on display for visitors. The kingdom was established around mid ninth century B.C. and was conquered by the ancient Iranian people of Medes in the early sixth century B.C.